We are working toward our first 50 mile endurance ride of the season, the Owyhee Tough Sucker I, on April 7. Normally we'd have plenty of time to get the horses in tip top shape, but what with the bizarre weather - snow, rain, mud, hurricanes, repeat - and the trip to the AERC Convention in Reno, and an upcoming road trip where we won't be back home till 5 days before the Tough Sucker, we felt we had to get a 20 mile ride in on the horses. 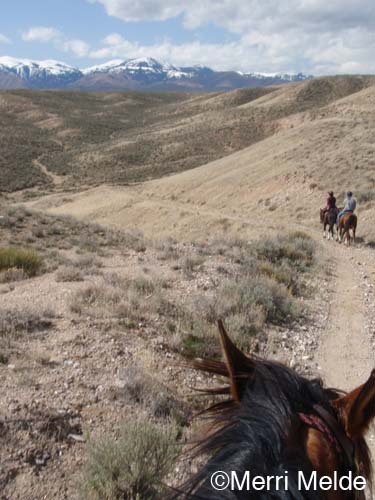 We made a long loop toward the Snake River, trotting much of the way, on soft ground, mostly flat and with only gentle climbs. Even though the horses are starting to shed madly, they still have enough of a coat where they worked up a thorough sweat (yes, even Jose's eyebrows sweated again). We were grateful for the most excellent strong cool breeze that caught up with us right near the end of the ride, most especially because the DANG GNATS are suddenly out! By my GPS, we covered 15.7 miles (and if you add the 10%, that's 17 miles), close enough to the 20 we aimed for, in just over 2 1/2 hours. I think *I* ended up much more tired than Jose - I was the one who needed the 20 mile ride!